Potentiation can be life-altering in itself—and certainly was in my case. Not only did it save my life; it also gave me back my life after years of debilitating allergies and chronic autoimmune illness. Leigh and I soon realized, however, that it was possible to go beyond Potentiation through other “ener-genetic” modalities employing different vowel codes of sound and light. Initiated by a one-time, half-hour session similar to Potentiation, Articulation is appropriate as of roughly the five-month mark of Potentiation. This second phase of the Regenetics Method is designed to enhance the enormous creative potential of the second bioenergy field and corresponding chakra. 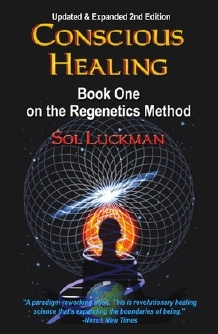 The Regenetics Method grew out of the discovery that the human bioenergy centers are “ecosystems” where a number of factors spanning the body-mind-spirit spectrum work either harmoniously to create vitality or disharmoniously to produce illness. Regenetics further recognizes that the second ecosystem, the Fragmentary Body, exists in most people as a bioenergy vacuum that to a large degree separates spirit and matter—keeping “torsion” energy (universal creative consciousness) from naturally healing and transforming our lives. Science has its own versions of the fundamental fragmentation at the heart of human existence. The particle-wave duality, in which atomic components—including those that make up our cells—are simultaneously particles and waves, is a primary example. DNA codes all living organisms in two ways, both with the assistance of DNA matter involving RNA and enzymes for protein synthesis, and by DNA sign wave functions, including coding at its own laser radiation level that functions bioholographically. In Wholeness and the Implicate Order, Dr. David Bohm also describes the brain as a hologram designed to interpret a larger hologram: the cosmos. Through extensive muscle testing with hundreds of clients, Leigh and I discovered and “mapped” a total of nine bioenergy centers in the human bioenergy blueprint. The initial blueprint for our creation, however, was clearly one in which instead of nine, we had only eight fields corresponding to eight chakras. This is a pivotal concept for anyone interested in permanent healing and radical transformation. There are many reasons why our true bioenergy blueprint is based on the number 8. The one I offer here is of a visual nature. What do you get when you turn the number 8 on its side? An infinity sign. This is our divine birthright expressed in a symbol. In Potentiation the bioenergy centers recalibrate from an imbalanced and unstable nine to an infinite and harmonious eight in number as the Fragmentary Body is repatterned out of existence. This creates an “infinity circuit” in the bioenergy blueprint. In this process, the ninth bioenergy center (which governs DNA) “seals” the second bioenergy center. “Sealing” is a sacred marriage of opposites—a way of initiating the healing of duality at the bioenergetic level. Sealing occurs at approximately the five-month mark of Potentiation—at which point the second bioenergy center transforms from an energetic liability to an important ener-genetic switchboard governing DNA function. Articulation “potentiates” this newly established bioenergy center, facilitating the integration of novel potentials that begin unfolding from the ninety-seven percent of potential DNA now ready to be accessed. Many of these new potentials are related directly to the potent life energy of the second bioenergy field, the corresponding chakra, and the associated organs: the oral and reproductive systems. This life force, which is a concentrated form of bioenergy, has been called kundalini. Kundalini is the individual’s own “life-wave” of torsion energy. This energy is pure universal creative consciousness placed in the individual at conception. In Vedic teachings, kundalini is considered the highest evolutionary force humans possess with the power to unfold our full bio-spiritual potential when awakened. To clarify a point for those familiar with the metaphysical tradition of India, kundalini is a primal energy that sits atop the first chakra, serpentlike and mostly dormant because of the energy disruption constituted by the Fragmentary Body just above it. The key to raising your kundalini without forcing things and hurting yourself lies in the second chakra—which when “sealed,” naturally begins to bridge kundalini at its font with the higher bioenergy centers. Articulation activates this life-wave at the genetic and cellular levels, providing a constant bioenergy supply for creativity in all areas—including artistic expression, interpersonal communication, healthy sexuality, and rebuilding through diet and exercise. Many people who feel they have become “stuck” in some aspect of their Potentiation report being propelled forward again in their healing and transformation following Articulation. This makes sense because with a new bioenergy matrix (with no energy disruption or leakage in the form of the Fragmentary Body) in place after sealing, the body, mind and spirit begin to crave the evolutionary energy that Articulation activates. Since the Fragmentary Body has been sealed through Potentiation, the stimulation of kundalini through Articulation is safe, gentle, and continuous. The sealing of the Fragmentary Body that occurs in Potentiation, followed by activation of the former Fragmentary Body in Articulation, makes possible further healing—including the profound level of emotional transformation that often occurs during Elucidation. 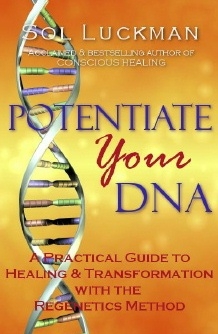 Read about Elucidation, the third DNA activation in the Regenetics Method.